Click here to view more photos of the dedication. MILLIGAN COLLEGE, TN (Oct. 25, 2013) — Today, Milligan College celebrated the dedication of the new Milligan Village, a student residence community consisting of five new residence halls, recreational space, and a panoramic view of the college and the natural beauty surrounding the area. The Village boasts five new halls named for people who have shaped the college in variety of ways ― from the classroom to the board room. They include Hampton, Jeanes, McAnally, Pardee and Wigginton Halls. The Village dedication also included the official naming of Burleson Court, a sand volleyball court and popular gathering space for Milligan students, and Leggett Lane, the new road behind the Milligan Village. The Milligan Village is the first new residential project the college has undertaken in more than 20 years. In his remarks at the dedication, Greer acknowledged the many people who had a hand in making it a reality, including Dr. Donald Jeanes, his predecessor and Milligan’s 14th president. Jeanes dreamed of expanded and improved housing at Milligan. “Without his leadership, we would not be here today. I think he would be proud of his college today ― and I hope he is looking down upon us with satisfaction,” Greer said. Thanks to the generosity of Richard and Leslie Gilliam of Charlottesville, Va., funds were secured for the excavation and grading, the construction of roads and parking, and the installation of all utilities, not only for the five initial buildings, but for the remaining seven buildings to be built in later phases of the Village project. The college broke ground on the Village in the summer of 2012, and the first group of students moved in when the fall 2013 semester began in August. The Village is designed to combine the privacy of suite-style living with the college’s vibrant community life. Each residence hall suite houses up to five students and includes five private bedrooms revolving around a centralized living room and kitchen. It also includes a large commons area used for student activities such as studying, gathering and intramural sports. Attending Friday’s dedication were Milligan students, faculty, staff, administration, Board of Trustees and friends of the college, as well as many of the people whose legacies are honored in the naming of the Village facilities. “We are grateful to all of the people who helped make the dream of the Milligan Village a reality,” said Jack Simpson, vice president for institutional advancement. Hampton Hall: Thanks to the generosity of Rebecca Hampton Plumer and her daughter, Amber Anne, Hampton Hall is named in memory of two of Milligan’s beloved professors, Roy and Wanda Lee Hampton. After serving in the U.S. Navy during World War II, Roy Hampton graduated from Milligan in 1949. While at Milligan, he also met his future wife, Wanda Lee Coil, who taught Greek from 1948 to 1951 at the college. For 46 years, Roy and Wanda Lee exemplified true servant-leadership through their marriage and their ministry together at Milligan and elsewhere. The Hamptons served at Milligan for 17 years. After their retirement in 1992, Roy and Wanda Lee continued to be strong supporters and advocates for Milligan. All three of their daughters attended Milligan and both of their sons were U.S. Naval Academy graduates. Three of their 12 grandchildren graduated from Milligan, and another granddaughter, Amber Anne Plumer, is currently enrolled as a student. Jeanes Hall: The naming of Jeanes Hall is made possible through the benevolence of longtime Milligan trustee and chairman of BancTenn Corporation, Bill Greene, with deep appreciation for Don and Clarinda Jeanes and their friendship, vision and commitment to Milligan. Don and Clarinda served as Milligan’s 14th president and first lady from July 1997 to July 2011. Their dedication, work and love for Milligan and her students reach far and wide to include not only the Milligan campus, but the local region and beyond. 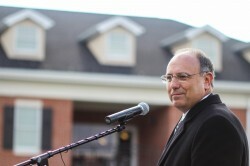 Under Jeanes’ leadership as president, Milligan experienced significant growth and achievement. During her time as first lady of Milligan, Clarinda Jeanes formed the Associated Ladies for Milligan. It was during the Jeanes presidency that the college purchased additional acreage in preparation for the future expansion of campus. Don dreamed for more and better student housing. Construction of the Milligan Village project began just before his unexpected death in August of 2012. McAnally Hall: A retired school teacher, Ruth McAnally maintained a lifelong commitment to education. It was through this commitment that she became closely connected to Milligan. She and Clarinda Jeanes, former first lady and wife of past president Don Jeanes, worked together as educators in the Johnson City School System. In her later years, it was Don and Clarinda who cared for Ruth. She died at the age of 101 in November of 2012 as the oldest member of First Christian Church in Johnson City, where Don and Clarinda ministered and worshiped for many years. Ruth was a lifetime member of the Associated Ladies for Milligan. Further, she wanted Milligan to receive her estate so that the important work that takes place at the college might grow. The naming of McAnally Hall recognizes this gift and her provision for a Christian liberal arts education. Pardee Hall: Funds provided for the naming of the Milligan Village’s Pardee Hall are thanks to gifts from Pardee Rowdies and those who fondly cherish the memories that will forever surround life in Milligan’s original Pardee dormitory. To Pardee Rowdies, the affectionate name given to those who at one time inhabited her hallowed halls, Pardee is legendary. The pranks and stories, retold and relived by Rowdies, are forever cherished. The original Pardee Hall was built in 1919 and was named for Calvin Pardee of Germantown, Penn., the owner of the Cranberry Iron and Coal Company and supporter of Milligan for many years. Constructed adjacent to the P.H. Welshimer Memorial Library, Pardee Hall was a vital part of Milligan campus life. For 73 years, this building housed Milligan students, serving as both a women’s and a men’s residence hall. At the time of its demolition in 1992, it was Milligan’s second oldest building. Wigginton Hall: The college is grateful to Tressa Wigginton Treadway and Denise Wigginton Hamilton, whose generosity, along with the gifts of other family and friends, made possible the naming of Wigginton Hall in honor of their parents, Gene and Shirley Wigginton. Gene Wigginton came to Milligan in 1971 when he accepted a position as director of development. He later served as executive vice president, leading the college through a very difficult time financially. In the spring of 1983, the couple moved from Milligan to Cincinnati where he began a career as publisher for Standard Publishing and later served as president. The Wiggintons continue to be generous supporters of Milligan. Gene served as a member of the college’s Board of Trustees for many years. Shirley is a lifetime member and supporter of the Associated Ladies for Milligan. Burleson Court: Now a popular gathering space for Milligan students, Burleson Court is named in honor of longtime friends and supporters of Milligan, the Burleson family and Burleson Construction of Johnson City. Burleson Construction has been a strong partner with Milligan for decades. Tommy Burleson, the company’s president, is a member of Milligan’s Board of Trustees and has served the college in this capacity since 1998. Strong friends and benefactors of the college, the Burlesons have been involved with many of the college’s major construction projects including, most recently, the renovation of Derthick Hall and the construction of the Elizabeth Leitner Gregory Center for the Liberal Arts, the Gilliam Wellness Center and the Milligan Village. Milligan is grateful to Tommy and the Burleson family for their ongoing generosity and faithful support of Milligan over the years. Leggett Lane: The new road behind Milligan Village, Leggett Lane, is named in honor of Dr. Marshall and Jean Leggett who served as Milligan College’s 13th president and first lady from 1982 to 1997. During the Leggett presidency, Milligan experienced increased enrollment and added its first master’s program, the Master of Education. The college also completed several building projects under his leadership, including the construction of Quillen, Kegley and Williams Halls, which were the last residence halls to be built on campus before the construction of the new Milligan Village. Marshall retired on June 30, 1997.